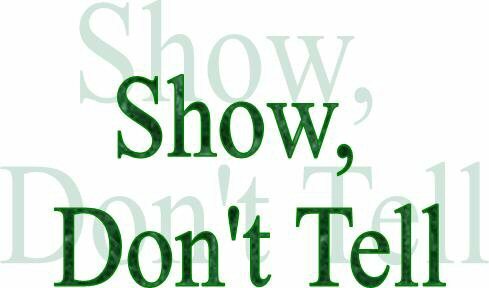 We’ve all heard it before: Show, don’t tell. But what does that even mean, really? How do we stop ourselves from doing it? Where’s the harm? People tell writers this all the time, but sometimes I feel like even I don’t know what to do with that. Showing: My fists clenched at my sides, and I could feel my eyes burning as I glared at him. Showing is so much more work. But isn’t there such a thing as too much showing? How do we know when we can tell rather than describe? Is it instinct? Is the distinction something that you understand better as you grow as a writer? Because to the best of my knowledge, there is no basic formula for this rule. There’s a delicate balance between too much and too little. Myself, I follow instinct. If I feel the reader needs to know something right off the bat, I’ll tell you. But if it’s a dramatic moment, a climax, or something important hinges on a certain scene, I’ll run off description like it’s going out of style. Show, don’t tell. How I hate those words. I think it might be one of the most consistent rules that writers have to follow. Strange, isn’t it, considering writers don’t really have rules? Share time. How do you guys know when to show, tell, describe, inform, and so on and so forth?